We cut thousands of feet of HTV every week, in doing so we are left with tons of scrap. We have literally hundreds of boxes full of scrap HTV, each box weighs over 35lb's each. If we accidentally cut a sheet too short we will put it in a scrap box. If we come across a sheet that has a slight imperfection we put it in a scrap box. 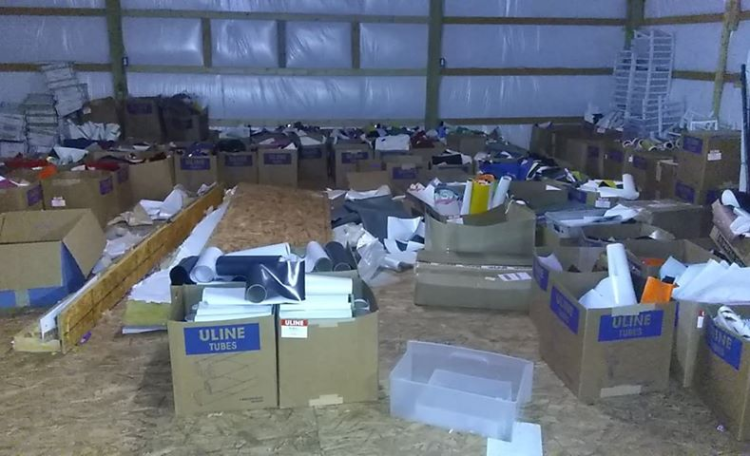 We store all of our scrap HTV in several parts of our shop that the public will never see. We used to auction off scrap HTV on our facebook page every week, but it was too time-consuming. On average we received bids in the range of $120-$150 for a 10lb pack of scrap HTV. You will be able to purchase as many scrap packs as you want. You will be able to purchase these scrap packs with ANY other regular priced items(s), BUT, you must pay a shipping charge. Shipping charges will be based on the total amount of your order (see the top right of this page). DO NOT use ANY free shipping option that we offer for these scrap package. If your order does not have a shipping charge you will be refunded MINUS $5.00 for not following directions. You can purchase "one penny grab bags" with these packs as long as you meet the qualifications on the one penny grab bag page. Each pack will have approximately 20 sq. feet (total) of HTV, all assorted colors. The sheets will range from 5x12 inch all the way to 12x24 inches. Each pack will include at least 75% solid colors of siser and/or thermolfex, the remaining 25% may be glitter HTV, patterned HTV, or any other type of HTV that we offer. The majority of these scrap packs will be 100% full of siser or thermoflex. We have literally hundreds and hundreds of these packages in our shop. We receive these returned packages almost every day at Craftvinyl.com. This could be because of a credit card dispute or the customer used the wrong shipping address and the package was returned back to us unopened. The original customer has been refunded 100% for their purchase. Instead of going through each order and taking the time to restock each individual item we will put the entire package on this page at a deep discount. All of these orders contain a variety of the different types of vinyl that we sell. You will get the original packing slip so that you can see what type of vinyl that you purchased, but, we will mark out the original customer’s personal information. These packages will sell out very fast. You are wasting your time if you email us and start complaining that you weren’t fast enough, these packages are first come first serve and are open the USA only. Each order shown in the video will be un-boxed and then re-packaged. YOU MUST WATCH THE VIDEO ABOVE TO UNDERSTAND THE "RULES". If you ignore the video or don't follow the "rules" you will be refunded, period. If you try to add one of these packages to your cart and it says "sold out" at checkout it means that somebody else has already purchased the package but we haven't had time to update this page.